When one has more than one hobby its always interesting to see how they can cross. Two of my passions happen to naturally fit well together; 3D Printing and Games. 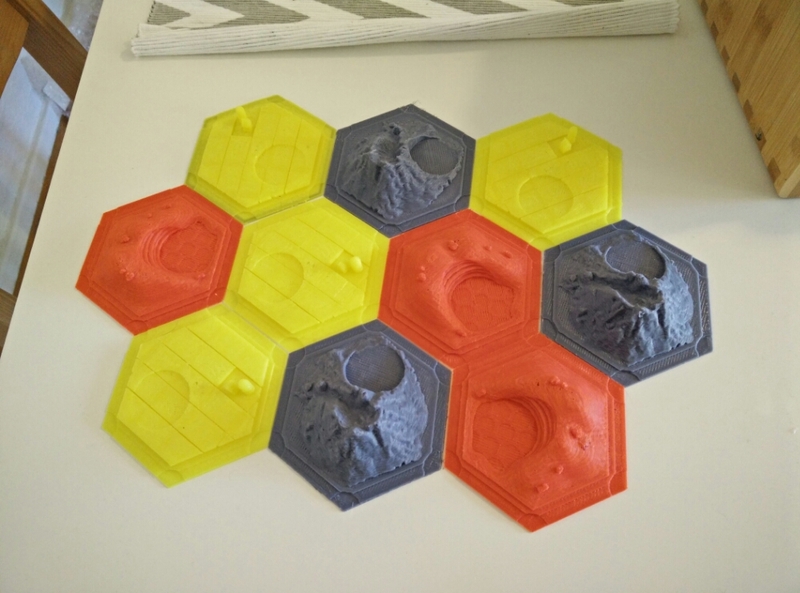 Board and tabletop gaming mesh perfectly with 3D printing. How many times has a little piece of plastic gone missing from a box, only to be noticed weeks later half way through the next playing of the game? 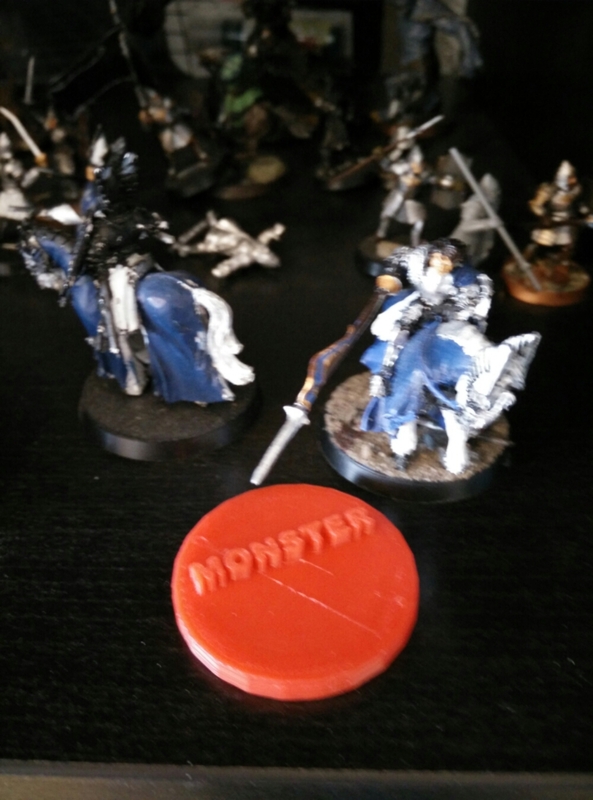 A small unicolored plastic token, that is what FDM printers are best at! Better yet, should you have to model the new piece yourself all the pieces from the box are usually the same shape so you have an object from which to take measurements. I had a missing Catan road piece that was easily replaced by some ABS plastic. One could easily see printing missing Monopoly houses or a militia man from Risk, pieces that get lost so easily and so often. 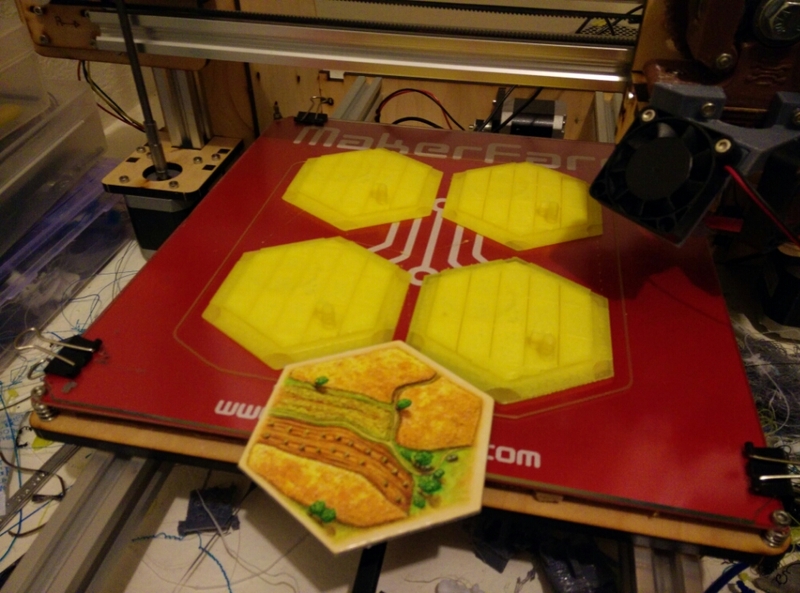 Why stop at small pieces, I am in the process of rebuilding my Catan set with entirely 3D printed tiles. But this is only the first step, 3D printing and games can benefit from a closer association. So a 3D printer can replace a missing piece from a game, but what about a game that had no pieces to start with. Dungeons and Dragons and many other ‘Table Top’ role playing games do not require anything but paper, pencils, and imagination. Though imagination is all that is needed many players have found that adding drawn maps and physical tokens to the game are beneficial organizational tools and help encourage more role playing. Many campaigns will use what they have on hand; bottle caps, guitar picks, and thimbles. Some of the more committed will get Games Worksop miniatures or buy sets of models from Wizards of the Coasts. But with a personal fabrication device, why would anyone want to do that, just print them. There are a few artists who have started making and providing models of creatures, monsters, and dungeons elements often found in the worlds of Dungeons and Dragons to be printed and used. A committed and industrious Dungeon Master could try and print all the party’s encounters before the group meets. This is not always easy as the party will not always take the path the DM planned and encounters are sometimes unexpected by all involved. We have started using the 3D printer to print custom marker tiles, labeled “MONSTER” to denote where on the grid the big beasties are. This with some adhesive vinyl and wet erase markers lets us enact any encounter. My group uses hero characters out of my set of old Games Workshop miniatures but for players who are attached to their characters there is now a service, Hero Forge, that lets DnD players customize a character design and then have it printed on high resolution SLA printers. While its hard to get the same detail out of the popular FDM printers now, in the future creating one’s character might involve some 3D design and extruded plastic. So the 3D printing community can take a game and repair or enhance with this new technology. But what about the future of table top and board games, how might that be affected by the rise of 3D printing? Since it may take years to decades for 3D printers to be common place in households (if this ever happens at all), the first place games will see innovation from 3D printing will probably be inside the packaged box. Game makers with access to 3D printing will be more easily able to prototype mechanically and visually complex game pieces. The parts that the home player would get would still be injection molded plastic, but used as a rapid prototyping device a 3D printers will make these pieces easier to design and play test with before the manufacturing run starts. If 3D printing ever does become common place, then there may exist a market for digital distribution of physical board games. Table top and board games that come with printable STL files instead of playing pieces. Catan might be reduced to a deck or cards and a download code, tiles and play pieces all to be printed. This can make games cheaper, more flexile and shake up typical board game distribution channels. If a 3D printing enthusiast were to look online now there are already a couple of independent games designers making games to be printed and played. Some are calling the spread of 3D printing the start of a new home industrial revolution and I think that may be a big step away from where the technology is headed, but if there is ever is a time with a Form1 or Makerbot printer next to the family InkJet then games seems like an industry that should easily adapt to this new revolution. Its about $30 for a kg but some specialty plastic are a little more.